A good place to start your research is with a general subject database, such as Academic Search Premier, as well as with subject specific databases, such as ERIC for Education research and ECON Lit for Economic research. 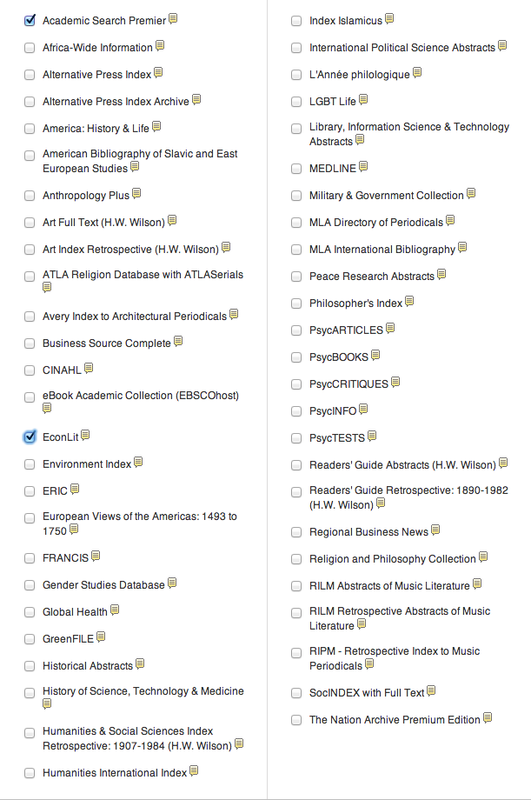 Current; multi-discipline, full text database, designed for the academic community. Includes full text coverage for just under 4,700 journals, including 3,600 peer-reviewed journals. 1966-present; ERIC is a digital library of education-related sources of interest to educators, researchers, and the general public, and consists primarily of electronic bibliographic records describing journal and non-journal literature. The collection has been expanded to include full text of specific articles and other electronic resources such as audio and video materials. 1900-present; source for information in all major social sciences disciplines. Useful for retrieving recent articles which cite a known earlier article. 1983-present; pre-eminent resource for Congress-watchers who need non-partisan information on Capitol Hill. 1923-present; explores a single "hot" issue in the news in depth each week. Topics range from the environment, health, education and science, technology and social issues. 1989-present; abstracts information from major journals in political science, including public law, and international relations. 1914-present; includes periodicals, books, hearings, reports, gray literature, government publications, and Internet resources. Subjects include politics, public policy, government, international relations, law and ethics, human rights, economics, business, finance, and other social sciences. 1900-present; Policy File Index is a unique resource for U.S. public policy research in that it grants users access to timely, updated information from over 350 public policy think tanks, nongovernmental organizations, research institutes, university centres, advocacy groups, and other entities. Over 75 public policy topics are covered, from foreign policy to domestic policy. The majority of Policy File Index records link directly to the full-text report, paper, document, or other source. For help getting started, see Quick Start Guide for ProQuest Congressional Digital Research Collection.